I’m back at the same place tonight. The minute I dropped my bags in the room I hurried out to the waters because it was already dusk and I didn’t want to miss at least a glimpse of the waters before dark. As I walked over a walking bridge adorned with lights, I remembered the rock pile. Would our rock still be there? Probably not. And even if I could find it, it’s likely our names would be washed away. Maybe even another couples’ names would be written on it. As I walked up to the pile, I remembered that last year we had no snow…but this year, there is a significant dusting of snow that is coating all of the rocks. I began to dig anyway. I dug until my fingers froze. No luck. Then I realized I didn’t even remember what shape the rock was. So I took out my phone and searched for the picture from last year and then noted the shape and looked some more. Still no luck. I was about to give up – it was no big deal (right?) – and then the thought crossed my mind that maybe it got moved. Maybe as others were placing their rocks down over the past year, ours shifted. I walked up the hill a ways and gave one final sweep of my frozen hand through the snow…and I saw it. The right shape. But nothing was written on it. Just like I expected. I picked it up and peeled off a layer of ice in hopes that maybe I could still see a faint shadow of our names. Nothing. Not even a hint. I casually flipped the rock over…and saw their names and remembered. 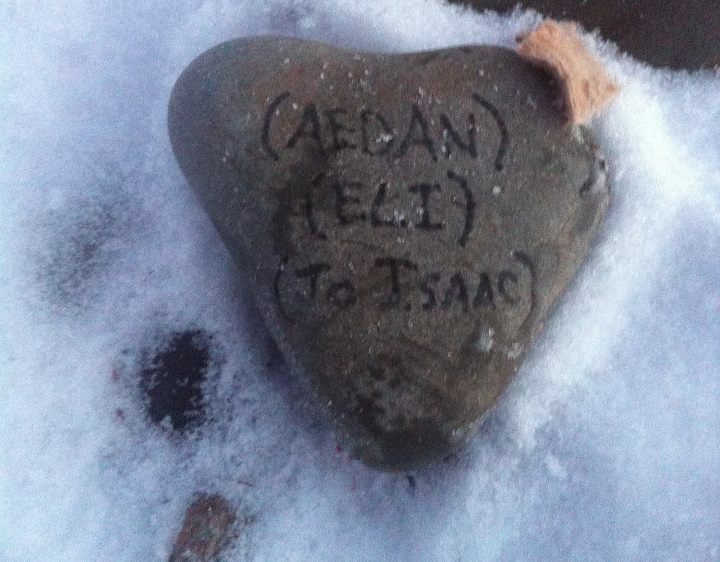 Jeremy had written Aedan, Eli and Jo Isaac on the back. It was significant then. They were significant to us. But today, their names being on that rock is entirely more significant. It’s a gift. The one side is hard to gaze upon. It’s entirely empty. Void of our names. Void of the bliss. This year, if I were to etch a name, it would be only mine. And I won’t be doing it. The rock is coming home with me. But the boys’ names still remain. And as I wonder what life is supposed to look like for me as I grieve this terrible grief, I can flip that rock over and stare at their three names. I have plenty to do. Plenty to focus on. Plenty of ways I can pour out my love. 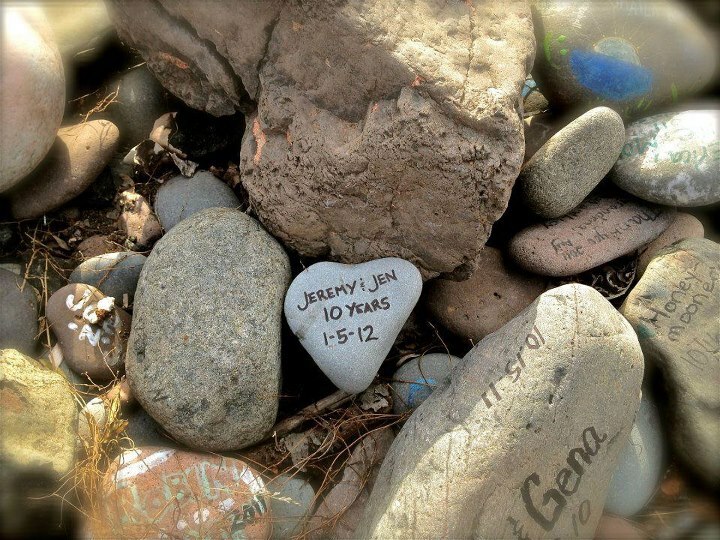 The “Jeremy and Jen – 10 years” implied a lot for us. We had lived a lot of life together and had suffered through some stormy seasons and we were stating it was worth it. Entirely worth it. We had been weathered. But we were very much alive. I don’t think we gave it any thought as we layed it down and walked away. We left it there to endure the sunshine and the storms and the wind and the snow. And the harshness of this year entirely wiped it away. It’s much of what my heart feels this weekend. He is entirely gone. And a part of me is, too. But the names of the boys, whom we had placed face down in the dirt. Not to be seen or read by anyone. Not to see the sunshine. Those names were so sheltered and so protected that though the sun and storms and wind and snow came, they remained. It is the other side of that rock that wrecks me these days. I’m sure it will for a long time. I need His grace to understand it. I need His kindness to bring comfort and answer the relentless questions that haunt my mind. Why must this be? But I’ll look on the other side for now – to be encouraged and to be reminded of His promises.